This unit at the VUE has those stunning views that everybody is talking about! A beautifully layed-out space, this unit offers 3 bedrooms & 3 Â½ bathrooms and a den, over 2,600 square feet of living space and one of the most desirable floor plans in the building. The modern finishes that this unit offers are gorgeous, making this condo a must-see! Starting down in the parking garage with your 2 private parking spaces, take your semi-private elevator straight to your personal foyer. From the moment you enter the condo, the views are breathtaking. The condo is light and bright with a great open concept, perfect for entertaining guests. The kitchen is every chef's dream, including upgraded appliances and a large quartz island with additional seating. The floors have been upgraded using the sought-after Aqua Series Wood Porcelain, and the bathrooms truly have a luxurious look that will not disappoint, including a large marble walk-in shower in the master suite. Amenities include 24 hour concierge, valet parking, beautiful first floor lobby, spa, fitness area and pool. The VUE is also very pet friendly, allowing residents up to 2 dogs. In case you don't want to hop over to Bayfront Park to walk your pet, just head up to the rooftop, complete with a 8,000 square foot dog park! 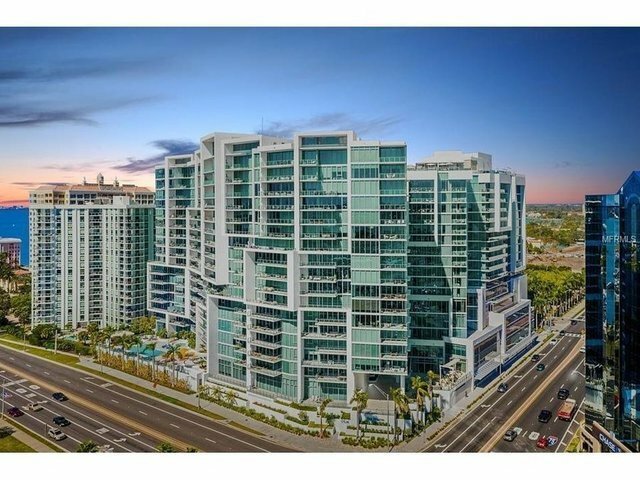 Just a walk to Marina Jack, popular downtown areas such as restaurants and theaters, there is nowhere more desirable right now to live than the VUE. Remarkable new price!